Ever felt the need to shout to the heavens how lucky your friend is on the slots, while you are sitting there with only meagre winnings? Click here to play! Well, now the tables have turned as you can earn yourself a stack of cash, and the enviable title of Lucky Barstard! Come on down and play You Lucky Barstard today across three reels and a single pay line. If you manage to spin up a Black Bar symbols in three consecutive spins, the Cash Ladder Gameshow bonus game will be triggered. Additionally, as you play the game, you will be given the option to nudge or hold any of the reels; this will allow you to make your own luck at the slots! End up spinning three Triple Bars and you will be able to call yourself a Lucky Barstard with 100 times your initial wager in payouts. Win yourself a stack of cash and wait for your friends to call out 'You Lucky Barstard'. 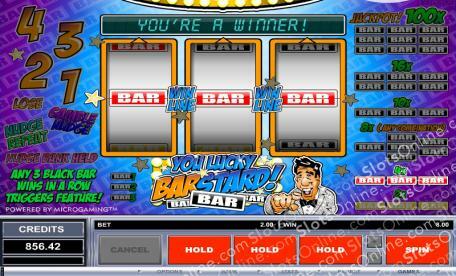 If you manage to spin up three Black Bar wins in a row, you will activate the special Cash Ladder Gameshow Bonus Game!